On August 25th, 2017, it's going to feel pretty f#ck!ng real to you too. 20 years after the original date of Skynet coming alive, James Cameron's 4K 3D conversion of his 1991 movie Terminator 2: Judgment Day is set to return to theaters. 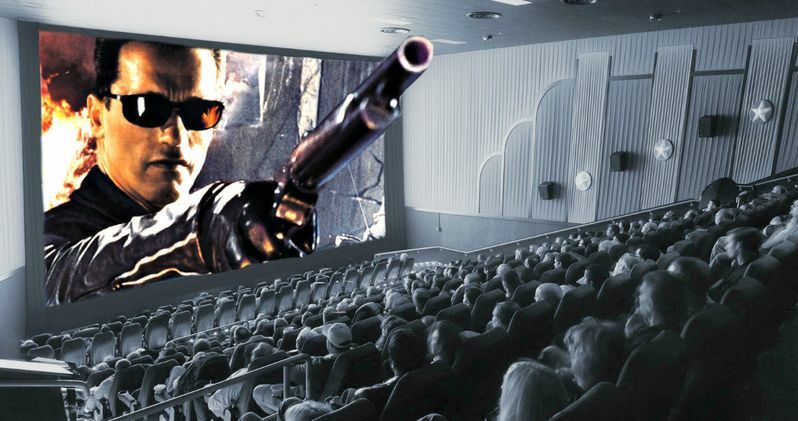 At the time, Terminator 2 was the most expensive movie produced, costing a whopping $102 million back in 1991 due to the extensive and groundbreaking visual effects. The movie was a box office success, earning upwards of $500 million at the worldwide box office, not to mention what money it made on the home video circuit in the early 1990s. The new trailer for Terminator 2 3D features Cameron talking about the movie and how amazing the 4K and 3D look. The trailer comes to us courtesy of Distrib Films US' YouTube channel and even in 2D, the 4K viewed through YouTube looks impressive. Cameron says this. "The images feel more real in 3D. There's lucidity to it, you really feel like you're there." James Cameron went on to say that many fans of the movie were too young to see it in theaters, so this experience will allow those younger audience members a chance to see this iconic Terminator movie for the first time and at the very best quality available as well. Terminator 2 3D will screen exclusively at AMC Theaters starting on August 25th, 2017 and executive VP at AMC Elizabeth Frank shared the company's excitement in bringing the movie back to theaters. "Terminator 2 has stood the test of time and is hailed by critics as one of the best sci-fi movies in film history. Now, the fully restored version of the classic will take the already extraordinary special effects to a new level." Frank went on to say that AMC is privileged to bring the classic movie back to the big screens as well as introduce it to a new generation of fans. James Cameron oversaw the 4K transfer as well as the 3D conversion and the work took over a year to complete. The original 35mm negative was scanned and then restored in 4K at Deluxe LA, under direct supervision of Cameron's Lightstorm production company. After the 4K transfer, Stereo D (Rogue One, Jurassic World) converted the movie into 3D, which was also overseen by Cameron and Lightstorm. Francois Scippa-Kohn of Distrib Films US said, "the 4K 3D restoration and conversion of the film looks stunning, and after 26 years the film hasn't aged one little bit." Terminator 2 3D stars Arnold Schwarzenegger in his most iconic role in what is arguably the best movie in the Terminator franchise and now we'll get a crack at seeing the movie in the best quality available in immersive 3D. There's no word on whether moviegoers will have to put on 2 million sunblock to survive the new screening, but that news is expected to be announced soon. So as a precaution, maybe just bring that 2 million sunblock with you. Check out the brand new Terminator 2 3D trailer featuring James Cameron below.